I try to use green and chemical free cleaning products at home whenever I can. Years ago my sister and I became obsessed with cleaning everything with vinegar because it worked so well and was safe for our little ones. 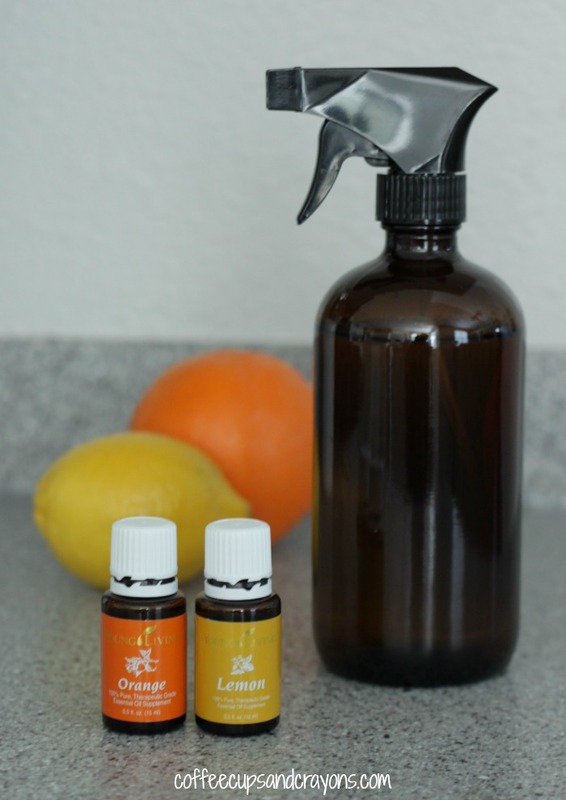 I came up with this homemade citrus all purpose cleaner recipe that has all the cleansing power of vinegar with an extra punch of goodness from citrus essential oils. They make it smell so good too! Affiliates links are included below. To make homemade citrus all purpose cleaner add the vinegar to a bowl and dilute it with the water. Next slowly pour the baking soda in and let it dissolve in the vinegar solution. I do it as I am stirring. If you go too fast you will have a little explosion so go slowly! Once it’s all dissolved add the 15 drops of the orange essential oil and 15 drops of the lemon essential oil to the bottle and mix together. Then pour into the spray bottle and start cleaning! You can use the essential oil citrus spray anywhere you would normally use vinegar. Some people say it gets streaky on marble and granite so try it and see if it works for you. I use it all over as the daily all purpose spray at my house. Looking for MORE homemade cleaning recipes??? We’ve got you covered! 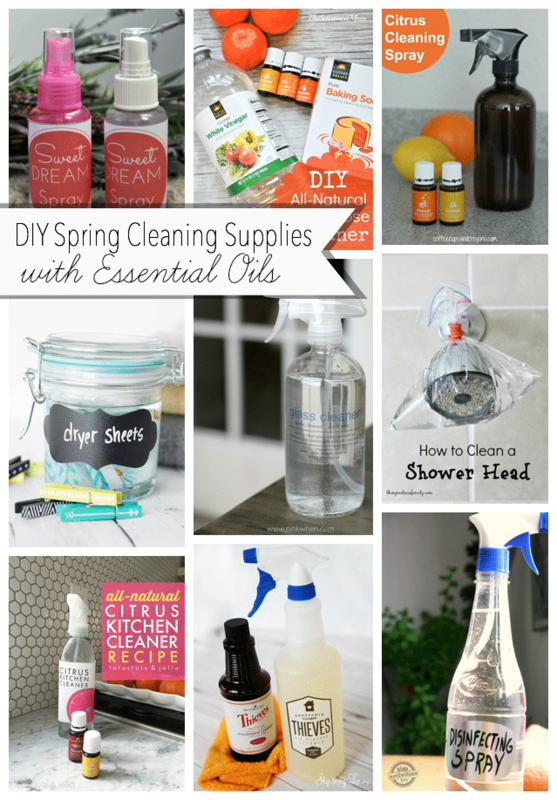 Here are 9 DIY spring cleaning recipes to get your house fresh and clean in no time! 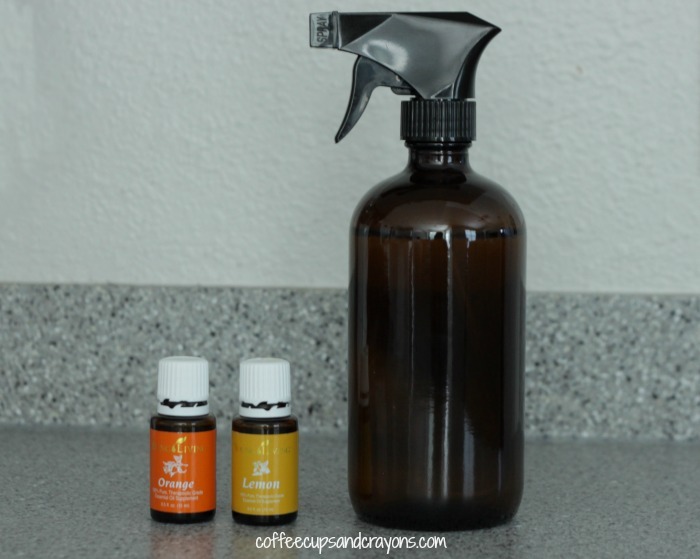 Thanx so much for posting this homemade all purpose cleaner. I often wondered if lemon and orange really went together well. I have some cleaning to do tomorrow and will be making this. I don’t have a glass spray bottle so I’ll have to use a plastic one. I’m sure that I’ll use the entire batch so using plastic shouldn’t be an issue. Since this cleaner includes baking soda, do I have to rinse? Thanx for your response. Nope! It will all dissolve! I really like the all-purpose cleaners! I like to try different recipes so I am very happy to find your blog! Thanks for sharing! This is a great idea! There’s not a good scientific reason to add baking soda and vinegar. I love the scent of mixing citrus oils. I can’t wait to make this and try it out!